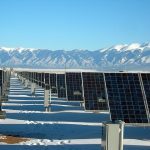 EnergyTrend Launches "Solar Powering Taiwan: Special Report"
Taiwan develops its solar energy system starting from rooftop projects and then moves toward ground-mounted PV power plants. Development of rooftop PV projects has been steadily on its track. Within the framework of Taiwan government's 20 GW solar goal by 2025, the policy will be carried out by rising installation growth rate each year. New policies and regulations will be promulgated continuously. 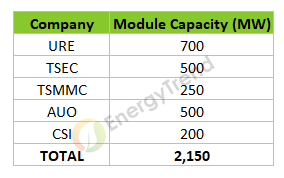 The government has been looking fo available for PV system installation. In the first half of 2018, Taiwan's new solar capacity sets a new record at 470 MW. In addition, module price fell in Taiwan, so PV system's cost dropped to near the price level in Germany, Italy, and Netherlands and is expected to decrease in the future. According to EnergyTrend's “Solar Powering Taiwan: Special Report,” Taiwan's PV installation in 2018 is expected to reach 850~920 MW. 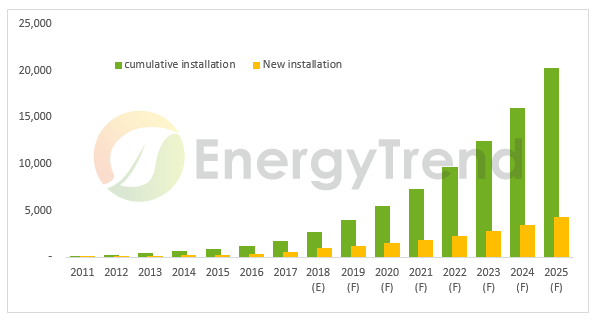 In order to reach the government’s target of 20GW in total cumulative installations by 2025, the PV installations in Taiwan will have to increase at a CAGR of 303% during 2018-2025. In the year 2025 alone, demand must exceed 4GW. 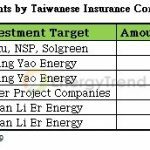 After the policies triggered local demand in Taiwan, quite some local Taiwanese companies announced to enter module and power plant businesses. This might be an opportunity of transformation for Taiwanese manufacturers who have been suppressed by China supply chain in the recent years. As module price falls, the capital expenditure of initial investment for system cost drops as well. In the second half of 2018, more developers are expected to increase their willingness to invest in system development in Taiwan. Solar PV system is a low-risk investment case because its risk is relatively controllable, and its cash flow is stable. In order to manage risks, excellent EPCs, operators and insurers need to cooperate together. EPC firms can use their understanding of system designs and effectively manage the project, so as to ensure steady cash flow. Regarding warranty, "Solar Powering Taiwan: Special Report" points out that before the power plant is constructed, 70% problems are from foundation. After the construction, 70% issues are from inverters. Therefore, the future local warranty service for inverters is crucial. For more information about Taiwan market's policies, solar PV developing potential, EPC companies, finance, risk management, details of operation & maintenance, modules, and inverters, please refer to " Solar Powering Taiwan: Special Report".